This Adult Defibrillator Training Pads bundle contains 1 pair of training pads in sealed pouches and a connector wire assembly. Did you know that if you purchase this adult AED Training Pads package along with our AED Training Conversion Kit you can easily convert your Lifeline AED into a standalone trainer unit which can be used for instructional purposes? This Defibrillator Training Pads for adults allows staff to get familiar with the correct emergency procedure for dealing with a sudden cardiac arrest. When used in conjunction with a trainer dummy it provides a hands-on training experience which helps to build confidence and knowledge and helps ensures the first aider will react confidently and correctly in a real-life situation. 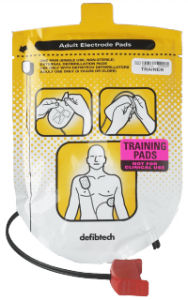 The Defibrillator Training Pads includes one set of training pads and a connector wire assembly in a sealed pouch, the training pads are semi-adhesive, allowing for multiple uses and are non-functional so they cannot be used to deliver a defibrillation shock. Did you know that if you purchase this Defibrillator Training Pads bundle along with our AED Training Conversion Kit you can easily convert your Lifeline AED into a standalone trainer unit which can be used for instructional purposes? Sudden Cardiac Arrest (SCA) is the world’s leading cause of death and can happen to anybody at any time, regardless of age or fitness level. In the UK alone, SCA kills over 140,000 people including 12 young people every single week. Young children require a lower voltage of shock and different pad placement if they go into sudden cardiac arrest. Early defibrillation is the key to saving a victim of SCA. Their chances of survival rise up to 70% if defibrillation is achieved within the first 3 minutes compared to a 5% chance of survival if a defibrillator is not present.